The concept that massage therapy can be easily misconstrued is not difficult to see. Many clients are asked to disrobe in a private room and have someone touch them in a soothing way. History hasn’t helped this misconception either. Many times throughout history, brothels have been masked by the facade of a massage therapy studio. The truth is there is that Massage THERAPY is nothing like the misconception people may have of the profession. Truth to the matter is that licensed massage therapists go through extensive schooling as well as testing the therapists knowledge on anatomy, physiology, kinesiology, as well as moral code. It truly is a slap in the face of the profession and those who have invested their time, money, and passion into the business of helping people. Understand that there is nothing wrong with your significant other giving you a massage at the end of a hard workday, but when you need more specific help you can rest assured that massage therapist out there trained in understanding the complex relationships of muscles and movement associated with the human body. In the field of massage therapy there are many different modalities that show how diverse the profession can be utilize to the benefit of the public. Continuing education that is required for massage therapist to retain their license allows the therapist to excel and keep them at the forefront of their specific specialties. It is this reason you are seeing the Allied healthcare community become more supportive of the profession and why you see massage therapists in rehabilitation centers, hospitals, doctor’s offices, and chiropractors. The medical professionals understand and trust the importance and many benefits of therapeutic massage. As you have read before in past BLOGS, low back pain is among one of the most frequent injuries suffered by most in the world. 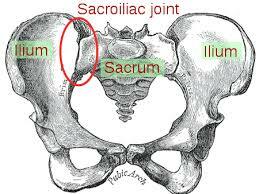 One of the main reasons for low back pain is because of Sacroiliac (SI) Joint Dysfunction. The SI Joint can be anatomically defined as the articulation where the Ilium of the Hip bones meet the Sacrum. The joint itself is protected and surrounded by many ligaments and muscles. Now why is this information so important to you? it would cause pain and difficulty in movement in our body just the same as if the shock absorbers on a car were to malfunction, it would be a pretty rough ride. as laying down scar tissue in the ligaments and tendons. This is the body’s response to protect it from additional injury, but if proper recovery and treatment isn’t followed, the scar tissue and tight muscles remain, causing limited motion in the joints which eventually leads to more problems. problems is to stay loose and retain great posture. Seek help and advice from professionals such as chiropractors, massage therapists, and physical therapists. They will be able to provide you additional information, assessments, treatments, and advice to optimize your SI Joint health and keeping you moving! Optimize YOUR Workouts with the Right Recovery! Beach weather is finally upon us and you know what that means, everyone wants to get their best beach body in shape and ready to head out. What this means for most is heading back in to the gym and for others it’s and increase in their workout. Either way, this can put a tremendous amount of stress on your body to the point it can cause pain and discomfort as well as limiting your ability and desire to keep up with your workouts. The most important part of a workout is the Recovery! The above Blog supplies you with 9 great ideas to help with your post-workout recovery. Follow this tips so that you can keep up with your workouts and so that you can move, feel, & BE better!